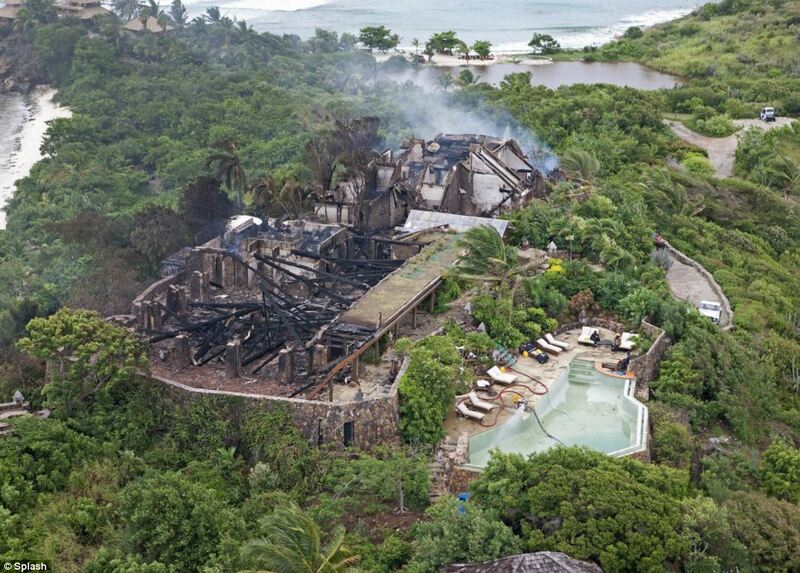 This still smouldering ruin was all that was left yesterday of Sir Richard Branson’s once-luxurious home on his private island in the Caribbean. The swimming pool and a Buddhist statue appeared to have survived intact. But the rest of the eight-bedroom Great House had been destroyed by the 200ft high flames that followed a lightning strike during a tropical storm in the early hours on Monday. Despite the catastrophe, Sir Richard vowed that his daughter Holly will still marry on £60million Necker Island in December, even if it means guests staying in ‘slightly more tents’ than they had initially planned. There is speculation that Prince William and the Duchess of Cambridge may attend. In total 20 people – including Kate Winslet and her two children – escaped when the Balinese-style house caught fire. Sir Richard, 61, was staying in a villa about 100 yards away with his wife Joan and son Sam, 25. However Holly, 29, and Sir Richard’s 90-year-old mother, Eve, were in the Great House. The Virgin tycoon praised Miss Winslet for helping his mother to safety, and described the actress’s children Mia, ten, and seven-year-old Joe as ‘two of the bravest kids I’ve ever come across’.